The Premier League is investigating Manchester City for allegedly breaching financial fair play rules. On Thursday, Uefa said it was looking into "several alleged violations" concerning FFP at the club. City claim the allegations are "entirely false" and on Friday, manager Pep Guardiola insisted the situation would not affect his legacy. The Premier League now says it is investigating financial matters and academy player recruitment at City. German news magazine Der Spiegel has published a series of claims, based on leaked documents, that Premier League champions City have violated FFP rules. The publication also claims City made a banned payment of £200,000 to Jadon Sancho's agent when the England winger was 14 years old. "The Premier League has previously contacted Manchester City to request information regarding recent allegations and is in ongoing dialogue with the club," a Premier League statement read. "The league has detailed financial regulations and strong rules in the areas of Academy player recruitment and third-party ownership. City won the Premier League in 2017-18 and currently top the table. This season they have been investigated by the Premier League, Uefa, Fifa - over allegations they broke third-party ownership rules - and the Football Association, over the claims relating to a payment to Sancho's agent. The club claims allegations in Der Spiegel are "resulting from the illegal hacking and out of context publication of City emails". FFP rules are designed to ensure the amount clubs spend on their players and wages is approximately equal to what they earn in commercial revenue and prize money. Uefa previously found City had breached FFP rules in 2014. 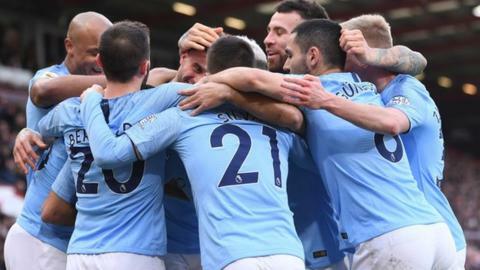 The two parties reached a settlement, with City paying a £49m fine - £32m of which was suspended - while their Champions League squad was reduced for the 2014-15 season. In January, Uefa's chief FFP investigator Yves Leterme said City could face a Champions League ban if the claims are proven.